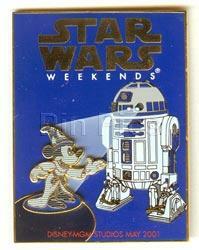 This pin has R2-D2 projecting a holographic sorcerer Mickey. The Mickey is 3-D and it reads Star Wars Weekends at the top and Disney-MGM Studios May 2001 at the bottom. This pin is a limited edition.